…and I’m sure she wished that she ordered more. I think we have established that I love being fed. No matter how foul a mood I’m in, I generally get happy when I get fed. So when I received this invite from Subway in my inbox – especially during a difficult week (I got hit by a car, amongst other things) – I was extremely excited to attend. The dinner was held in Moroccan Feast, a restaurant in Randwick with a great atmosphere and very friendly chef (more about him later). I arrived to long tables laid out with candles and salt and pepper bowls shaped like little tagines (how cute!) and was immediately offered refreshing cocktails to start the evening with. Soon, the all seats were filled, and hungry hungry people eagerly awaited the first round of deliciousness. A selection of dips were first laid out in front of us – Matbouha, which I understand is a capsicum relish, eggplant and aioli, and marinated green olives. And while the dips were extremely tasty, the standout part of all of it was the bread. Soft white bread surrounded by a crispy crust with a glass-like crunch was the perfect accompaniment to the dips. Many of us actually had to consciously stop ourselves and remember that this was just the starter, to leave room in out bellies for the rest of the food. As this dinner was to introduce Subway’s new Moroccan Lamb Sub, there was sure to be lamb in the menu. And the first manifestation of the lamb theme was in the form of spiced lamb cigars. These were served on a platter with vegetarian pastiles and mint yoghurt. The vegetarian pastiles were okay, but the lamb cigars were curiously addictive. I didn’t detect much spices in the cigars, but I really like the luxuriousness the mint yoghurt added to the dish. Yes, the yoghurt wasn’t particularly minty either, but it’s just really tasty! Besides, I’m not much of a mint person (I really don’t like mint chocolates that are all about the mint and kills most of the chocolate taste), so this combination suited me just fine. Just as the conversation was buzzing and the food was flowing, lilting music came on and we heard the sound of bells. Just as the thought of reindeer landing on roofs crossed my mind, this lady, resplendent in a blue jeweled and tasseled outfit, came dancing out. All this excitement, and that was even before the main. Betty and I shared the Moroccan Lamb Meatballs and Aubergine Tagine, and the Moroccan-style Barramundi with chickpeas. The lamb meatballs were sandwiched between 2 thick sliced of spiced aubergine. The bed of cous cous that it was served on was lovingly drenched in thick tomato-ey sauce and in turn, mint yoghurt was poured with a generous hand over rich meaty lamb. The barramundi – bottom photo – was nice and flaky, but the best part about it was the generously flavourful chilli and spices reduction. I could have just eaten a bucketful of the the reduction ladled over a bed of cous cous. The salad was another highlight of my evening. Sometimes, lamb can get a little bit…rich, and the two salads really lifted the tone and colour of the meal. While the rocket with citrus vinaigrette was nice, I absolutely adored the red cabbage with haloumi and pomegranate! Crispy red cabbage was dotted with little jewels that explode with a tart sweetness and was the perfect accompaniment to the hearty lamb. At this point, I’m sure you – as I was – are wondering what this meal has to do with Subway. Almost the entire evening has passed and there hasn’t been a sandwich in sight. Well, remember how I mentioned the extremely friendly chef? Well, Subway – in the spirit of “doing it your own way” – had asked him to take the new Moroccan Lamb Sub and to make it into a sit down meal. What we had eaten so far contained elements of the lamb sub! Remember the gorgeous white bread that came with the dip? Well apparently that was Subway‘s white bread that had been toasted and sprinkled with rock salt. The lamb was pretty obvious, and the mint yoghurt is the sauce that would be poured over the meat in the sub! I’m quite excited that the salad will be in the sub as well – I think I’ve found a new love in pomegranate. Besides the selection of fresh fruits that arrives – ripe figs with honey anyone? – tall martini glasses with a luscious scoop of pistachio ice cream, raw tahini and subway cookie crumbs come marching out. There’s not much to say about a Subway cookie though, besides OM NOM NOM. I must say that the nice people of Subway and Hills+Knowlton Strategies really know how to throw a party. By the end of the night I was filled with delicious food, happily nursing a food baby, and my taste buds were tingling. It would be interesting to see how the Sub form of the food will taste, but with so many great elements, surely you can’t go wrong. Added to that the rousing company in the form of Betty, Karen and Shan, good times were had all around. 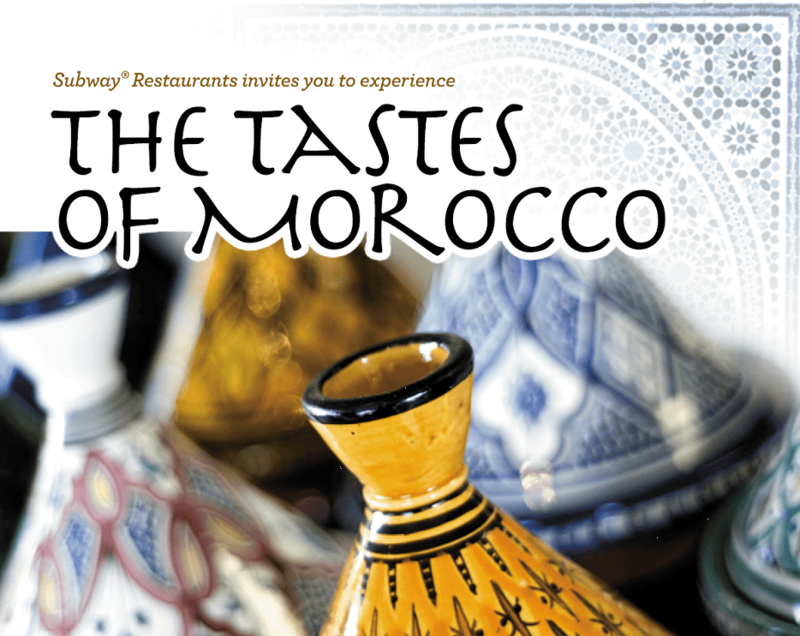 Tambourine of insatiablemunchies attended The Tastes of Morocco courtesy of Subway and Hills+Knowlton Strategies.